The weather was beautiful, the run along the Arkansas River was scenic, and Braden definitely surprised at the River Trail 15K on February 6! The River Trail 15K is a race Braden and I had circled on our calendar for quite a while. Sometimes Braden's heart and desire are stronger than his abilities and this is really evident in distance racing. It's been a little more than a year ago when he ran his first 10K race and he subsequently ran eight more during 2015, all the while he would ask me about running even longer distances...specifically half-marathons. Whenever he would ask, I would tell him that he needed to wait a few more years because it takes a totally different kind of commitment and training regimen to be able to run half-marathon distances. With all that being said, I gave him the option of taking a smaller step in expanding his distance with the River Trail 15K, which also has the added benefit of being a Grand Prix championship race as well. Leading up to the race, I would be lying if I said his training had been anything but challenging. Like was mentioned in my previous blog with the One Hour Track Run two weeks prior, Braden had fallen into a bad rut of not being able to put in any decent runs, especially when we needed to run longer distances. Because of his conditioning, his race on the track suffered as he had to stop a few times, and even though his overall performance was okay, he wasn't happy. I thought the feeling he had after the race would motivate him, but the next Saturday when we tried to get in a 15K run on a beautiful day, he gave out after only running a very slow 5K. I was really at a loss. In basically two months he had one run of 8 miles and another of 9.3, but the latter run had several stops including an extensive bathroom break. It was one week before the 15K and I was having to plead with him to give me one more big training run to be somewhat prepared. I gave him a rest on Sunday and wanted to run with him on Monday, but he said he wanted to run on Tuesday. I told him that this was it...our last opportunity...we we're going to do 9.3 miles even if he was going to have to walk it! On Tuesday, the temperatures were nice, but it was windy, so Braden opted to run on the indoor track in Conway. The indoor track is okay, but I really only like to use it during inclement weather. The inner lane is the one used for running where 8 laps is equivalent to 5,000 feet, and in order to get our 9.3 miles in, we had to run 79 laps. I don't care who you are, running 79 laps on an indoor track is not fun!! For the most part, everything actually went well. He did complain a couple of times about his ankle being sore and he did have to stop to take a few longer water breaks, but in the end, we got through our 9.3 miles in 1 hour and 38 minutes. Braden's face was beet red because it was warm indoors and I told him that I was glad he got through it and he would have the benefit of cooler temperatures on race day. After doing a little track work on Thursday, where he ran exceptionally well, I started feeling a lot better about how he would do on Saturday. Race day, and weather-wise it was spectacular for early February! All week the temperatures were expected to be in the low-40's for the start and 5-7 mph winds, but 24 hours prior, the wind forecast changed to basically calm to 3 mph winds...perfect. The family headed down to the Little Rock River Trail for the 9 a.m. start after making a couple of clothing adjustments because of the colder temps. I asked Braden how he felt and he said he was feeling very confident and I felt he was going to do good as well. I normally like to set a goal pace, but I just didn't have any idea since this was uncharted distance territory with the lack of training runs to boot. Papa Bernie said he was going to shoot for a 1 hour 25 minute finish and I told Braden he would need to run at a 9:00 per mile pace to beat him. I kept on going back and forth on different paces, but in the end I just told him I would let him know every once in a while what our pace was and to run based on how he felt. 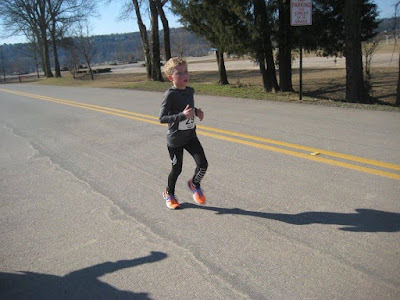 As it is, there there are not a whole of runners in Braden's age group that run 10Ks, and after reviewing past results of the River Trail 15K, he was going to be the youngest runner ever to compete in the race and would obviously be the only one in his age group. First place was guaranteed and the only pressure he felt was having a good performance and not losing to Bernie again. When the race began, we got off cleanly and didn't have to pass too many runners before we started settling in. The first couple of miles went by without incident and I had to tell him a few times we were going a little too quick for my liking, but if he felt good, we were going to roll with it. I did have to get on him twice when he all of a sudden just started speeding up to race others. Sometimes he gets caught up in seeing someone he thinks he should be ahead of and he starts racing with them, instead of within himself. I have to remind him to think about the big picture and if he runs his race, he'll eventually overtake them anyway without expending the extra energy. As we came up to the first water stop, and even though he didn't need to, I told him to hit it and take a few sips along with all the other water stops, so he could keep good and hydrated. About 2 1/2 miles in, we hit our first little hill and Braden's first instinct was to attack it, but I told him he needed to save his energy for later on, so he eased off. I was very pleased with our time, but was also hoping he didn't push himself too hard at the beginning to not have enough in the end. The next three miles were our worst as we grinded it out and we started getting passed by a lot of runners. I think this discouraged him a little, but it was really nice to hear the compliments and encouragement he was given by the other racers. I was constantly either telling him our time, pace, or counting down the amount of distance we had left. We had some some uphills, but nothing too bad, and based on a conversation we had with another runner, we knew there was one last small, but steep, hill to overcome at the 5 1/2 mile mark. After this uphill, the course would turn back and head to the finish 4 miles later, where it would be more downhill the rest of the way. We had passed Bernie a couple of miles into the race and didn't have any sight of him for the next few miles, but as our pace slowed down, he apparently caught back up because when we hit the steep hill and started to make our way back, I noticed he was only about 50 meters behind us. Despite his pace falling off for miles 5 and 6, he ran his second fastest 10K ever, so I was happy but still concerned if he was going to have enough left in the tank to make it without walking...especially since he was having to stretch himself for the extra mileage. Having Bernie behind us provided the extra motivation needed for Braden to finish strong. During our last three miles, the only thing I heard was him asking how much distance was left and him crying out that he didn't want to lose his papa. I kept encouraging him to dig deep, we didn't have far to go, and to turn it on after our last water stop. Bernie was hot on our heels and we couldn't shake him until the water stop. After we got our last swig of water, Braden put it into another gear and started to pick up the pace. We started re-passing runners and, even though he was really tired, he was pushing hard. Like a kid in a car going on a long trip, he kept on asking every minute where the finish line was, and after finally seeing it, I could tell he felt relieved. When we crossed the mats I was ecstatic! Our finishing time was 1 hour 21 minutes and 5 seconds at an 8:42 minute per mile pace! Braden ran the whole distance without stopping and knocked off 17 minutes off his training time earlier in the week. I couldn't have been more pleased with the effort he showed on the course and I told him it looked like he got his racing mojo back. I believe there were a couple of factors that helped him...Bernie being right behind us definitely was a motivation and if it had been windy, I think he would've struggled. He was exhausted but felt good after finishing, like the feeling I've had after running a half or full marathon...just a lot less painful. After having a few minutes to reflect on the race, Braden was happy but he told me that he was glad the 15K was done and the most he'll have to do the rest of the year is 10Ks. I asked him if he wanted to train for a half-marathon and he told me no way! Braden was thrilled to get his first place award and Bernie, who finished 53 seconds behind us, won second place in his age group. Alas, I didn't win anything, other than the satisfaction and pleasure of running with my boy. For his first 15K, Braden finished 114th out of 187 male runners and 156th out of 395 runners overall. Even better, he finished with an age-graded percentage of 71.11% (one of our goals is to reach above 70%), which was the 29th best percentage out of all the runners. With his first place finish, Braden picked up another 30 points for the Grand Prix and now has 60 for the year. I picked up 9 points and am actually sitting in 6th place in my competitive age group and Bernie picked up 27 points and is in 1st place in his age group. Our day wasn't over, though. After the race we packed up and headed to St. Vincent Hospital for the 2015 Grand Prix Awards ceremony hosted by Arkansas RRCA President, David Meroney and his wife, Christine. At the ceremony, all the age group and team winners, along with Iron Runners (those who compete in all the Grand Prix races), were given plaques for their accomplishments and I was prouder than proud when Braden got his. Hopefully it will be the first of many! Along with his plaque, he also received a $25 gift card to Go! Running where I'm sure we can put it to good use. My little man amongst the CRC ladies! We don't have long before our next race. 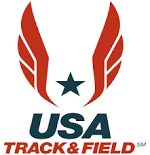 The Valentine's Day 5K is a non-championship Grand Prix race held in Russellville on February 13. Braden has already informed me he is wanting to break his PR time of 23:23 he set on Thanksgiving, so I'm looking forward to what he's going to bring.